In a flood of four new WAP! 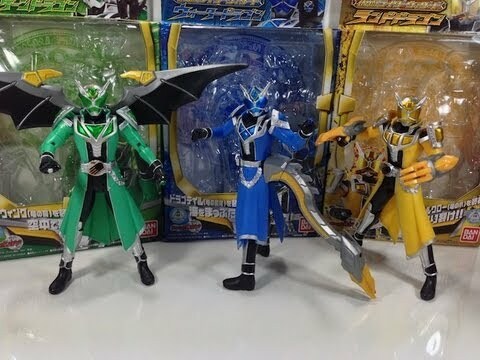 releases in the month of March, the final three Dragon forms for Kamen Rider Wizard were released for the normal price of ¥3,000. Like with Flame Dragon, the Dragon WAP! figures ditch the glowing head gimmick for a Dragon limb to attach to the figure, just like when Haruto uses the Special Wizard Ring in each formation. Hurricane Dragon comes with the Dragon Wings, Water Dragon comes with the Dragon Tail, and Land Dragon comes with the Dragon Claws. Each Dragon Form also comes with a clear colored version of the WizarSwordGun in Sword Mode and Gun Mode, both open handed. Each Dragon form uses the same mold, so all four of the Dragon Limbs can attach to any of the four forms to create Kamen Rider Wizard All Dragon. Sure, the show only utilizes Flame Dragon for the combination, but what's stopping you from using Hurricane, Water, or Land? Nothing. Overall, all three of these figures are fantastic. Yeah, compared to the SHF you lose out on some articulation, but that's a small price to pay for some cheaper figures that AREN'T Tamashii Web Exclusives (which all three Dragon forms are). The attaching of the limbs is really easy to do, retains all pose-ability, and looks pretty awesome. If you want a full display of Dragon forms, this is definitely the way to go. The articulation you sacrifice isn't 100% necessary, the entire collection is affordable and easy to find at retail outlets, unlike the SHF releases. Great figures overall, and I can't wait to check out Beast. Awesome Intro thanks to Ryokuya!